Witte de Withstraat, one of Rotterdam’s liveliest and well-known streets, has a new resident. 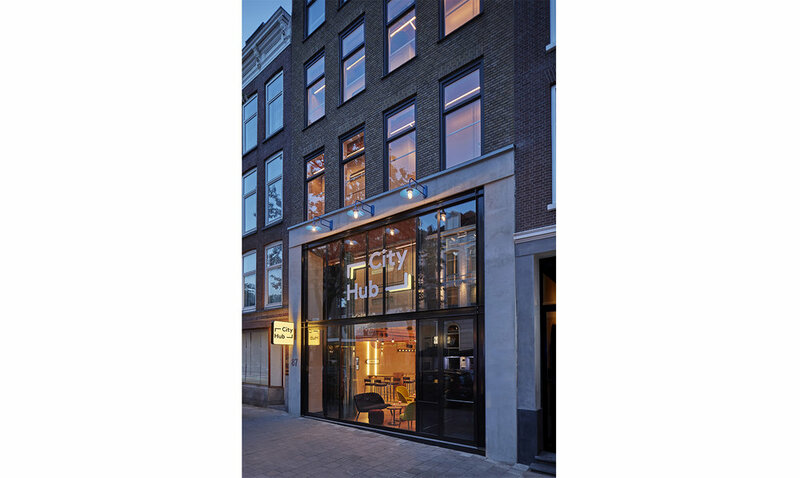 CityHub have modified three existing buildings on the street to create the second of their new, fresh and interactive hotels for the digital native. Those who are familiar with the CityHub concept will already know that it is no standard hotel. Typical rooms are replaced with futuristic sleeping unit or hubs. The hubs are aimed at a generation with a digital lifestyle, who make the most out of the interactive features and enjoy being connected 24/7. It is a place where the comfort of a hotel merges with the feeling of belonging to a community, not to mention the convenience of a hostel. The interactive nature of the hotel allows guests to arrive at any time, check themselves in and enjoy the space whenever and however they desire. It is the Hubs location and concept that has provided the inspiration for the building’s new interior design. Through preserving traces of the old walls and finishes and combining them with a new material palette, the three adjacent buildings have been cleverly merged to allow each to retain their individuality. The use of the CityHub colour scheme creates a unique ambiance in each building which makes the visitor aware of entering a new part while moving through the interior. The intensity of the colour changes on each floor, using daylight as a guide to ensure contrast. 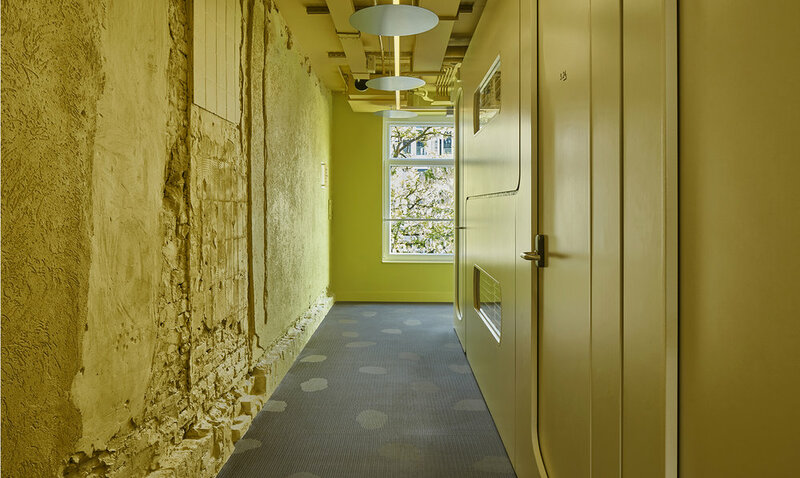 As sunlight moves through the building, the interior colours on each floor take a lighter hue to create a distinctive, lightening colour palette as you descend floor by floor. To achieve this effect a base colour has been chosen for the ceiling and is mixed with tones of grey to create the gradient for wall finishes. The floor carpet is a mix of coloured thread with varying grey tones. The coloured themed spaces in each building and on each level, emphasize the white hubs and highlight them in their surroundings. As visitors walk into the hotel lobby, a large white object draws their attention. Forming the digital check-in point, this element turns into a chandelier on the ceiling, splitting into several different light lines that guide guests throughout the entire building. Simple, elegant LED profiles with various shapes attached underneath continue above every corridor and staircase. This unusual, stretched-out, linear chandelier acts as a wayfinding sign and connects all the buildings. The light is reflected towards the ceiling or filtered to highlight accents in the interior. Signing, inspired by overlay of different materials in the existing buildings, plays a big role in the design. 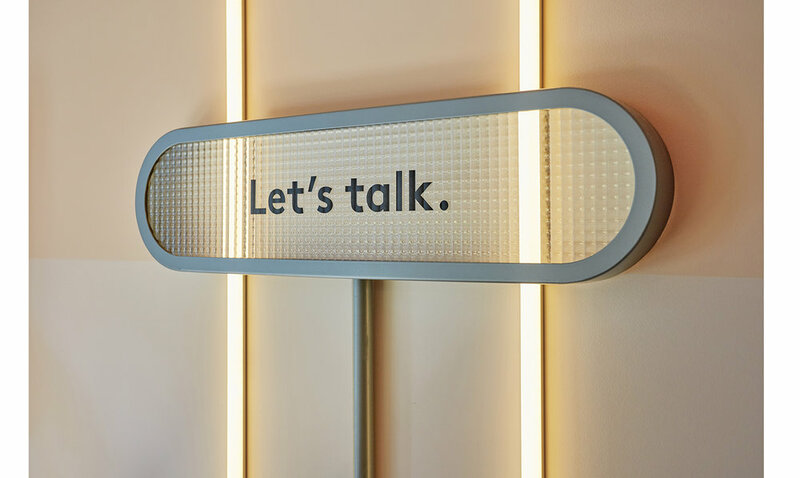 With catchy phrases applied on the walls, the building itself becomes a friendly host, referencing urban surroundings and inviting every passerby to step inside and experience the space. Hotel guests are welcomed to pour themselves a beer at a wooden self-service bar and meet other hub residents. A mirror ceiling reflects the benches, work tables and host station, where the city host directs the travelers with insider tips on what to do and see in the city. 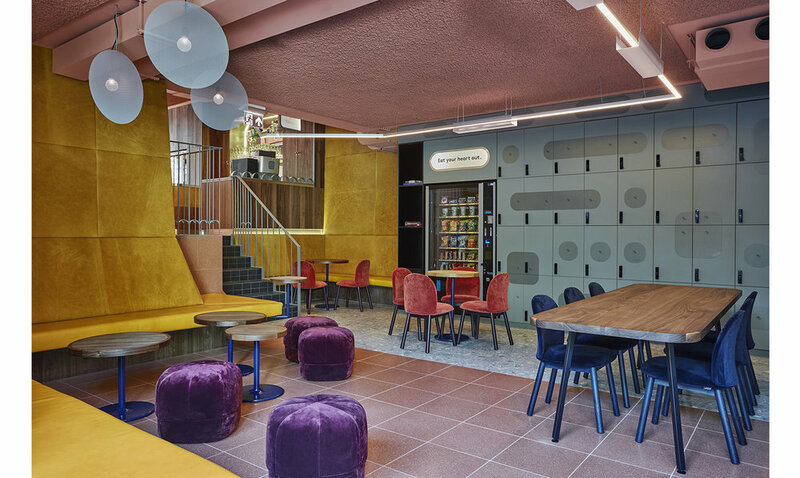 The lower ground floor level is occupied by a hangout seating area – a lively space influenced by the urban surrounding of the ‘Witte de Withstraat’. The street style has been brought in to the interior and fused with quirky lighting elements, textures and colour schemes of the nearby buildings. Sea green wall made of lockers seamlessly merges with the interior, floor tiles reflect the shade of the ceiling, while colours used on the walls replicate the lightest hues used throughout the hotel. The interior of the building is heavily layered, using not only various layers of materials, but also custom-made elements. The best example of this approach can be found in bathrooms, where bespoke sinks and wall cabinets partly cover the existing windows. Without blocking the view, a new layer is created over the old structure of the building. Bathroom finishes colours vary from blue to pink and go against gender stereotypes. 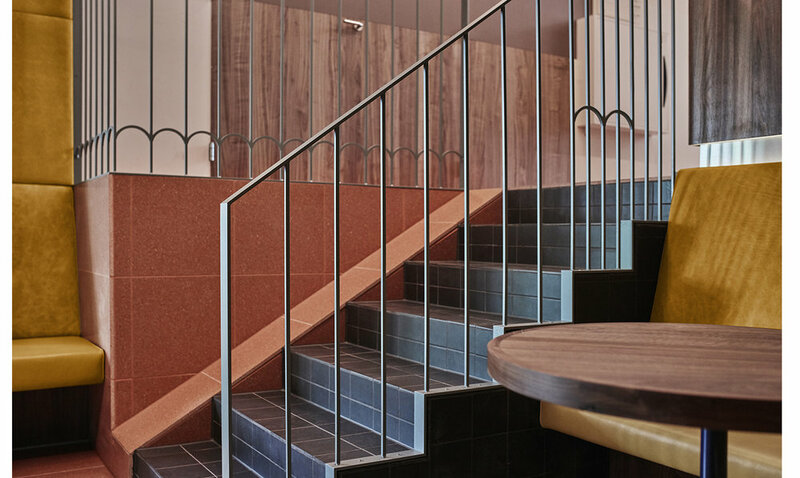 With various tile types and finishes, the colour schemes represent each of three buildings they are in and give spaces a fresh and playful identity. Completed with custom sink elements and mirror details, these common spaces are filled with sophisticated personal touches. The interior design of the new CityHub Rotterdam connects the building and its inhabitants with both the street outside and the city beyond. Its gradient colours spilling out, drawing attention to the bustling digital lobby and vibrant hangout while also giving a glimpse to private hubs and lives that lie above. The design team at Studio Modijefsky have created an alluring addition to the energetic street vibe of Witte de Withstraat. A place where the tech savvy millennials can hang out and connect, while those on the street can peek into the CityHub world from outside.